But as the program progressed and I adjusted to life with minimal fructose, I started to think about how much sugar must be in such a sundae. When a local restaurant published the recipe for their incredibly popular caramel popcorn sundae, I couldn’t hide from the truth – one serve contained a whopping 15 TEASPOONS of sugar (7.5 teaspoons of fructose), plus extra liquid glucose, waffle cones which probably also contain sugar, and even extra icing sugar to serve. Suddenly it didn’t seem so appealing anymore. So I thought: Sod it! [I’ve been watching a lot of British dramas lately]. I’m going to make my own. 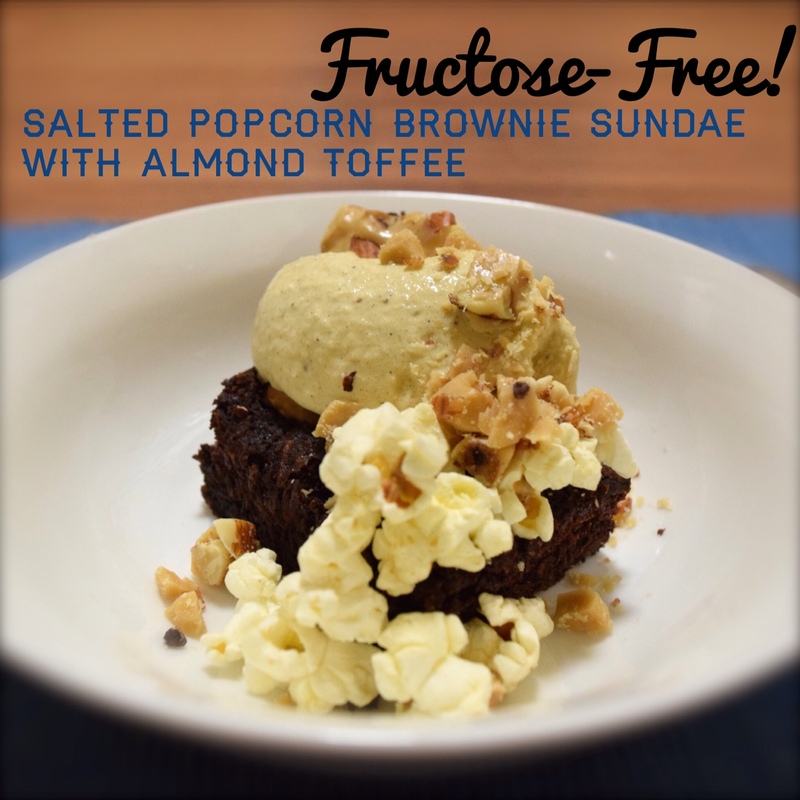 A Fructose-Free Salted Popcorn Brownie Sundae with Almond Toffee. I did. And it was delicious. My husband gave it high praise, and he is a hard critic when it comes to food. Coincidentally, the sundae is also gluten-free. This sundae has all the right textures: a soft and fudge-y brownie, creamy ice-cream, chewy popcorn and crunchy toffee pieces. A warm brownie to contrast with the cold ice-cream. Of course, it is sweet and salty; an ode to the cinema popcorn and choc-top combination. Although there are a few different components to make, they can be made over several days. The brownies can even be frozen, for easy access to future sundaes! To assemble the sundae, warm the brownie (if you want to), top with a scoop of ice-cream, a handful of popcorn, and a sprinkle of toffee shards. I like to include both larger toffee chunks and finely chopped toffee ‘bits’. Fructose-free almond toffee. Why didn’t I do this earlier!? This toffee is a great base for all manner of flavours and textures – other nuts, cacao nibs, coconut. I have to say, this toffee is a nice treat just on its own. Because it sets very quickly once cooked, ensure the nuts are already chopped and ready to throw in at the last minute. 1. Line a baking tray with baking paper. Place the rice malt syrup and butter in a saucepan and melt over a medium heat. 2. Attach a candy thermometer, increase the temperature slightly, and stir constantly until the mixture reaches 140 degrees Celsius. If you don’t have a candy thermometer, here is a handy guide on how to make toffee without it, using cold water. 3. Stir in the nuts and pour onto the baking tray. Immediately sprinkle with the salt. Allow to cool and harden completely before breaking into shards. Store in a container in the fridge. I used to love butter-flavoured microwave popcorn. Until I read the ingredients and discovered it was full of palm oil, and didn’t even contain butter. I don’t own a popcorn-maker and never had much success making it in a saucepan without burning it. So I was stoked to come across an easy method for making microwave popcorn from I Quit Sugar. It’s fast, very easy, requires no washing up, and you can control the amount of popcorn being cooked (I always found those microwaveable packets too big). 1. Place all the ingredients in a paper bag, and scrunch down the top to close. Microwave for two minutes, or until the popping slows. Shake. Voila! Store any leftover popcorn in a ziplock bag. This is probably the more complicated component of the sundae, and certainly the most time-consuming. 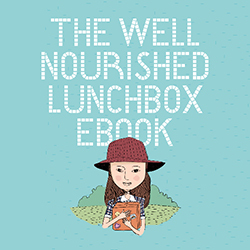 I made mine in a Thermomix, which has a simultaneous heating and stirring function, but it can still be made without one. I have included the instructions for both methods below. 1. Place all the ingredients in the TM bowl and cook for 10 minutes at 80 degrees, speed 2. 2. Transfer the mixture to a mould and cover with cling-wrap. Allow to cool, then transfer to freezer for 2 hours. 3. Place the mixture back in the TM bowl and whizz it up for 30 seconds, speed 7. 4. Return to mould and freeze for at least ten hours or overnight. 5. Before serving, break the ice-cream into pieces and mix for approximately 30 seconds at speed 5 until softened and creamy. Return any leftover ice-cream to the freezer. 1. Place all the ingredients in a saucepan and beat with a whisk until the egg yolks are well combined into the mixture. Heat over medium heat, stirring constantly, until the custard has thickened and coats the back of a wooden spoon. This could take up to 15 minutes. 3. Place the mixture into a food processor and whizz it up for 30 seconds, medium speed. 5. Before serving, break the ice-cream into pieces and mix for approximately 30 seconds at low/medium speed until softened and creamy. Return any leftover ice-cream to the freezer. Yum! That looks, and sounds, amazing. Especially the almond toffee!